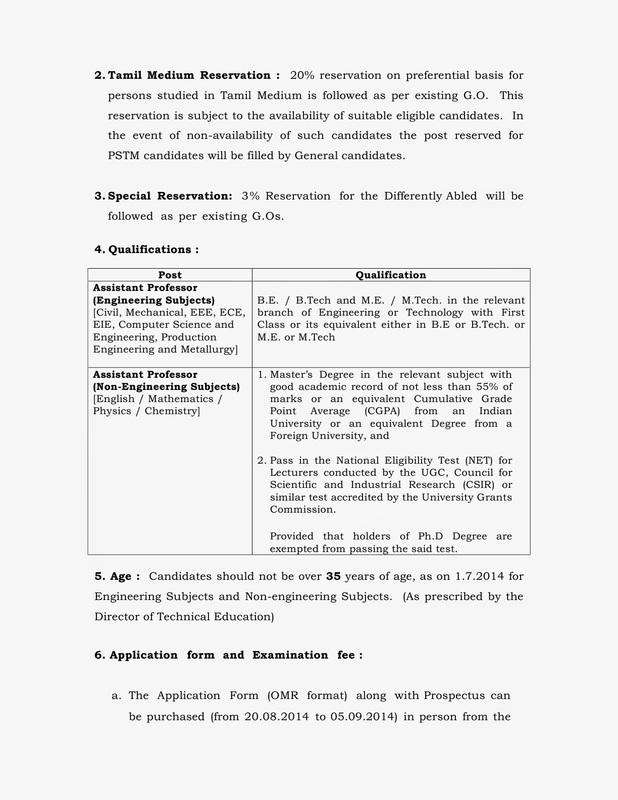 Applications are invited upto 5.00 P.M on 05.09.2014 for Direct Recruitment to the vacancies for the year 2013 - 2014 in the following posts. the event of non-availability of such candidates the post reserved for PSTM candidates will be filled by General candidates. 3. Special Reservation: 3% Reservation for the Differently Abled will be followed as per existing G.Os. 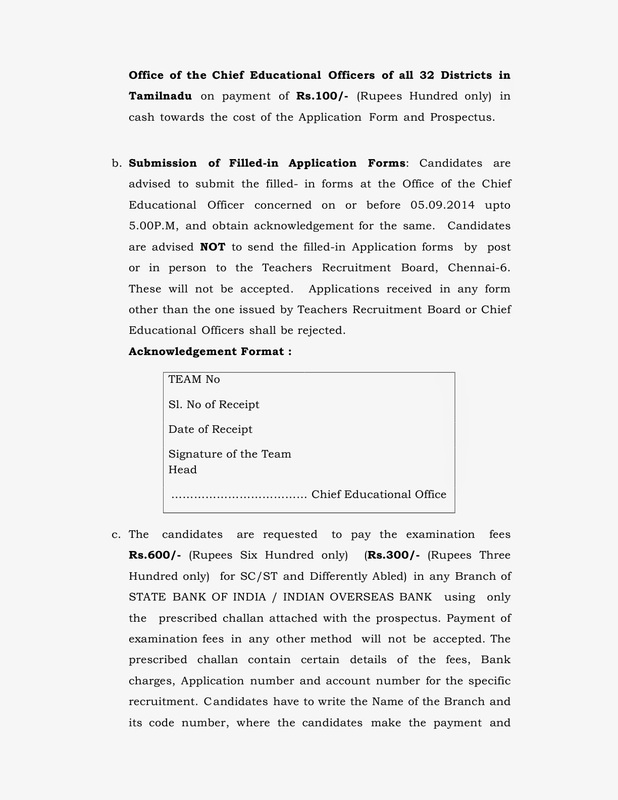 The Application Form (OMR format) along with Prospectus can be purchased (from 20.08.2014 to 05.09.2014) in person from the Office of the Chief Educational Officers of all 32 Districts in Tamilnadu on payment of Rs.100/- (Rupees Hundred only) in cash towards the cost of the Application Form and Prospectus. 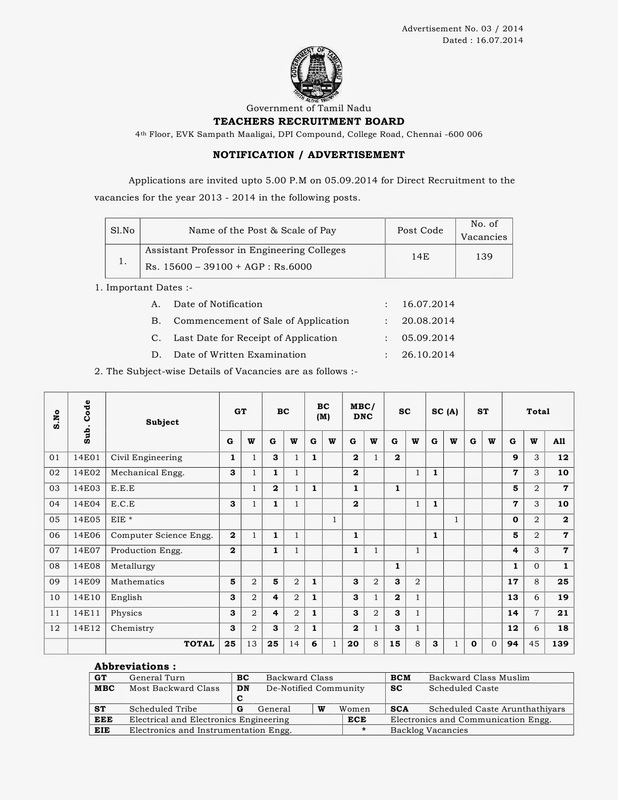 or in person to the Teachers Recruitment Board, Chennai-6. These will not be accepted. Applications received in any form other than the one issued by Teachers Recruitment Board or Chief Educational Officers shall be rejected. The candidates are requested to pay the examination fees Rs.600/- (Rupees Six Hundred only) (Rs.300/- (Rupees Three Hundred only) for SC/ST and Differently Abled) in any Branch of STATE BANK OF INDIA / INDIAN OVERSEAS BANK using only the prescribed challan attached with the prospectus. Payment of examination fees in any other method will not be accepted. The prescribed challan contain certain details of the fees, Bank charges, Application number and account number for the specific recruitment. C andidates have to write the Name of the Branch and its code number, where the candidates make the payment and other details in the relevant columns. 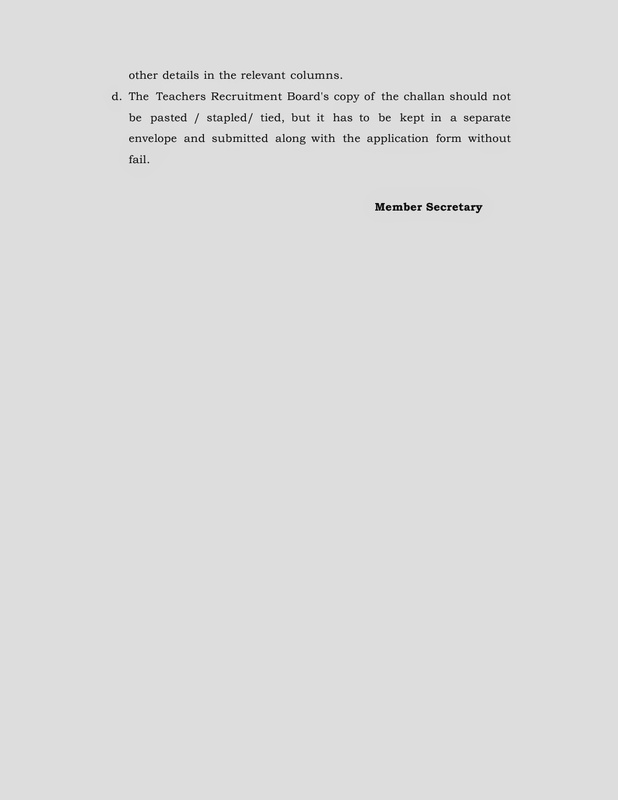 d. The Teachers Recruitment Board's copy The Teachers Recruitment Board's copy of the challan should not be pasted / stapled/ tied, but it has to be kept in a separate envelope and submitted along with the application form without fail.